This chapter reports on our performance for 2016–17 using the framework in both the 2016–17 ACCC Portfolio Budget Statements (PBS) (contained in the Treasury portfolio PBS) and the ACCC and AER Corporate Plan 2016–17. The ACCC and the AER jointly report against one outcome, with the ACCC reporting against Program 1.1 and the AER against Program 1.2, as shown in table 3.1. Lawful competition, consumer protection, and regulated national infrastructure markets and services through regulation. These include enforcement, education, price monitoring and deciding access terms to infrastructure services. Competitive markets increase the prosperity and welfare of Australian consumers. Our role is to protect, strengthen and supplement the way competition works in Australian markets and industries to improve the efficiency of the economy and to increase the welfare of Australians. This means we will take action where it improves consumer welfare, protects competition or stops conduct that is anti-competitive or harmful to consumers, and where it promotes the proper functioning of Australian markets. The AER is the national energy market regulator. The AER’s roles encompass the retail and wholesale electricity and gas markets and energy network infrastructure. The objectives of the national energy legislation guide the AER’s priorities and work program. The common objective through the legislation is to promote efficient investment in, and efficient operation and use of, energy services for the long-term interests of end users of energy with respect to price, quality, safety, reliability and security. Note: This purpose from the 2016–17 Corporate Plan is consistent with the objective in the 2016–17 PBS. promote efficient investment in, and efficient operation and use of, energy services for the long-term interests of consumers with respect to price, quality, safety, reliability and security (Strategy 4). some highlights that demonstrate how our performance in a specific area contributes to our strategy and thus to achieving our purpose. This Annual Performance Statement separately covers Program 1.1 (ACCC) and Program 1.2 (AER). The performance reporting sections for each program are organised according to the strategies and deliverables outlined above. other work we do that promotes and enhances competition. For Strategy 2 our reporting aligns directly with the four deliverables under this strategy. For Strategy 3 our reporting is organised by industry, noting the deliverables as they apply. For Strategy 4 our reporting aligns directly with the three deliverables under this strategy. outline the factors that affected our performance during the reporting period. We have also provided an ‘Analysis of performance’ section for each strategy where we discuss our work in more detail, including examples that demonstrate how we carry out the strategies to achieve our purpose. 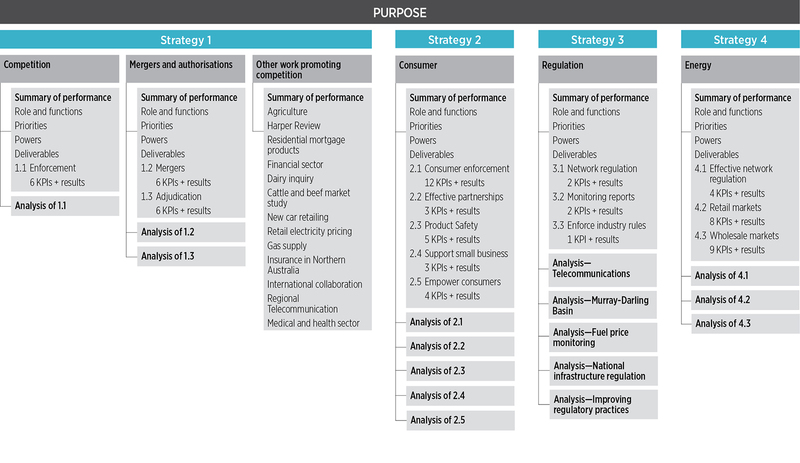 Figure 3.1 provides a guide to the structure of the Annual Performance Statement. 6. Regulators actively contribute to the continuous improvement of regulatory frameworks. These KPIs are concerned with how regulators administer regulation, with the aim of encouraging regulators to undertake their functions with the minimum impact necessary to achieve regulatory objectives. The framework does not seek to measure the performance of the ACCC in relation to the outcomes we achieve for Australian consumers and the economy. The ACCC’s self-assessment drew heavily on the results of a survey of over 1000 of the ACCC’s business stakeholders conducted independently by market research firm ORC International. Results of the survey were published in conjunction with the ACCC’s self-assessment. We also relied on other evidence, such as quantitative performance data and descriptive information that provides stakeholders with a greater appreciation of the systems and processes the ACCC has in place to support our engagement with businesses. The draft self-assessment report was reviewed and externally validated by the ACCC Performance Consultative Committee, which comprises 15 business, legal and consumer representatives who collectively cover the broad range of stakeholders that the ACCC engages with in undertaking its various functions. The 2015–16 self-assessment found that the ACCC is generally achieving the six KPIs to a satisfactory or good standard across the entire organisation. However, we identified various areas where our performance could be improved and have implemented a range of strategies to enhance how we engage with regulated businesses and other stakeholders. This will contribute to minimising the burden imposed on businesses from regulation while still achieving our purpose of improving the welfare of all Australians by making markets work for consumers. The ACCC’s self-assessment for 2016–17 will be published in November 2017. I, as the accountable authority of the Australian Competition and Consumer Commission, present the 2016–17 financial year annual performance statements of the ACCC, as required under paragraph 39(1)(a) of the Public Governance, Performance and Accountability Act 2013 (PGPA Act). In my opinion, these annual performance statements are based on properly maintained records, accurately reflect the performance of the entity in the reporting period, and comply with ss. 39(2) of the PGPA Act.